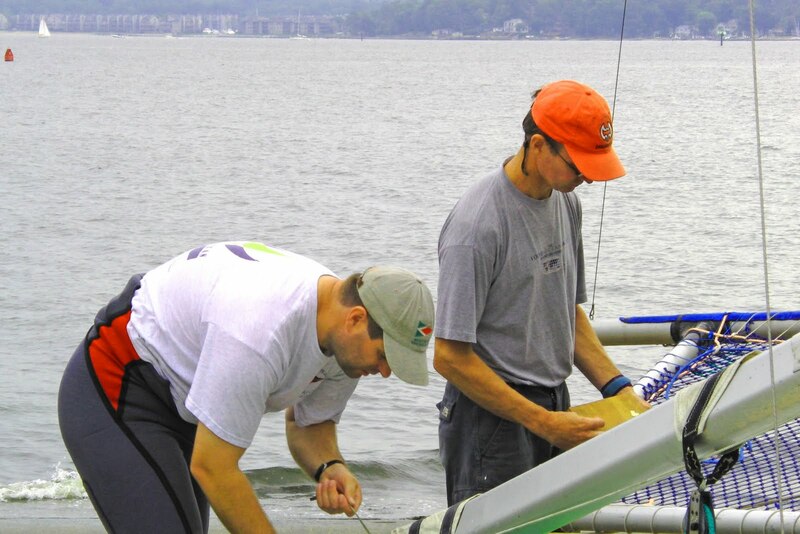 In the past year, the Mid-Atlantic Mothboaters have instituted a post-race ritual at the major Classic Moth regattas. We have a beer tasting. About four of us bring a craft beer (or two). This may be a beer that is one of our favorites or it may be a beer we know nothing about. We start by discreetly sipping and then pontificating. Not unlike the most effete wine snobs, we wax lyrical on the malts vs hops, the finish, the floral or citrus notes...... stuff we really don't know anything about. This seriousness rapidly degenerates when we then we ask for seconds and thirds and slurp it down....you get the idea. Great fun. At this years nationals the beer tasting extended over two nights and featured a wide assortment of craft brews. Ed started us out with Smashed Pumpkin Ale from Shipyard Brewery of Portland Maine. This is one PUMPKIN beer! The most pumpkin flavor of any pumpkin beer I have ever tasted. A real surprise and one I'll try to track down locally. Mike and Barb switched gears with a Triple IPA, Hop'Solutely from Fegley Brew Works . I'm more of malt man than a hop head but you could tell this was one powerful hoppy beer. Your humble scribe followed with a black IPA, Dogzilla by Laughing Dog Brewing of Idaho . I had chilled it which didn't do it any favors. Following the fruitiness of Mike and Barb's triple IPA, the heavy malt of Dogzilla seemed severe almost bitter. Maybe not the best way to showcase one of my favorite but different beer tastes going. Finally John Z brought Three Philosophers from Brewery Ommengang of upstate NY . Following my black IPA, Three Philosophers had a distinctly cherry syrup sweetness (it's blended with cherry lambic). You could almost say this is a desert beer. I'll cover Saturday's tasting in another post. These were over the week of Sept 18, 19. Twenty six Classic Moths and a couple more sitting on trailers. 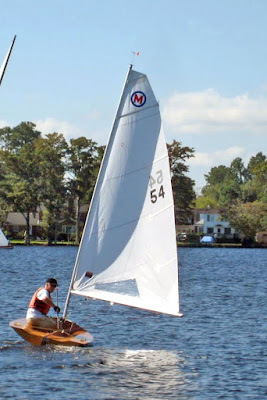 Great regatta and I'll get around to writing a full report but Joe B. at the "Madmothist" foiler Moth blog has put up a report over here . Sorry, I tried to edit out some of the jerky bits but my aging laptop is having problems handling the larger video files. If you don't have a particular interest in these sea stories from two of legends of the U.S International 14 class, Alan Laflin and Eric Arens, it would best to move on from this post. 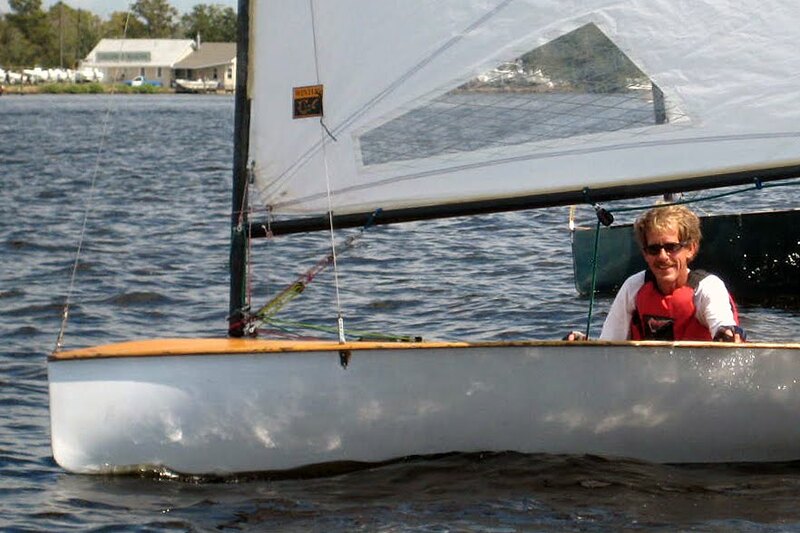 These two following videos from SailGroove are quite long but, for me, they represent the very fiber of my very early dinghy racing career (I know, I know, Geezerdom talking about those olden days....boring, boring, boring). For many these videos might be a snooze fest; for me, fascinating. Before proceeding, for background, it's best to link back to some of my earlier posts on Eric Arens here and over here . Now watch the videos of two of class stalwarts from ancient (well from the 1960's) I14 history reflect on these past 50 years (Alan is on the left and Eric is on the right). 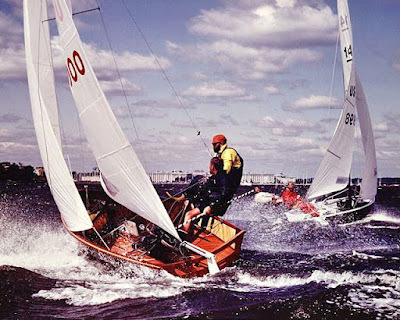 Here's a picture stolen from Yachting magazine (back when they covered sailing and sailboats) with Alan Laflin in the foreground, bashing back home after completing a race at the 1981 Annapolis International 14 Worlds. Big breeze for most of the week as you can see in this photo. 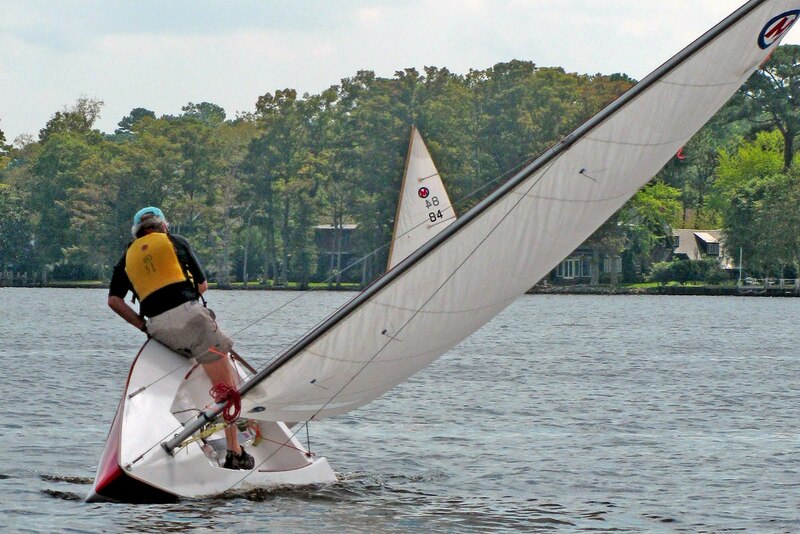 To windward are two other International 14 San Francisco legends, Mark Adams with Chris Benedict crewing. TOH to Eric and Alan and SailGroove. Bob's posted his second log canoe racing video. You get to see the community effort to get the main and fore masts raised on a log canoe. Also some great bow on shots from the bowsprit. The second weekend at Oxford saw big breeze for the log canoes. Only three made it to the finish. Island Blossom Log Canoe - Oxford Maryland from B. A. on Vimeo. Congrats to Island Blossom regular, Sean Smith, on finally getting engaged to Genevieve. Also congrats to my son, Chris, on his engagement to Sally. Since I've not done anything particularly noteworthy over the last two months, I'll keep leaning on my friends to provide blogging material. 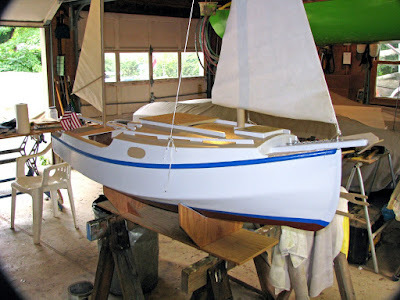 Bob Blomquist, prolific amateur boatbuilder, who I profiled in this post, is once again hard at work reworking another Bolger design; this time the popular and pretty Chebacco day sailor/ pocket cruiser. For more info, Doryman has an excellent post on the Chebacco up on his blog. Bolger designs lend themselves to customization and to create the perfect pocket cruiser, Bob has taken the Chebacco lines and raised the sheer, created a flush deck coach roof, added a double bottom in the cockpit, and designed in an inboard motor well. 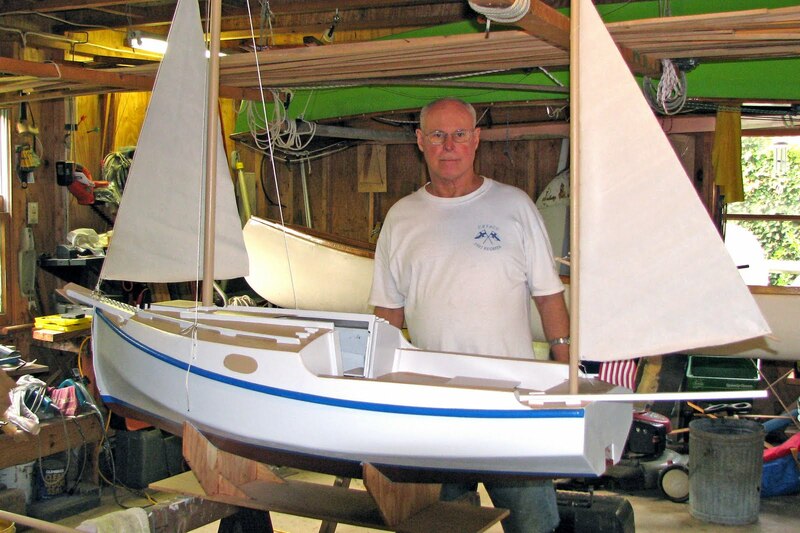 Bob built a substantial model to facilitate testing in a pool. 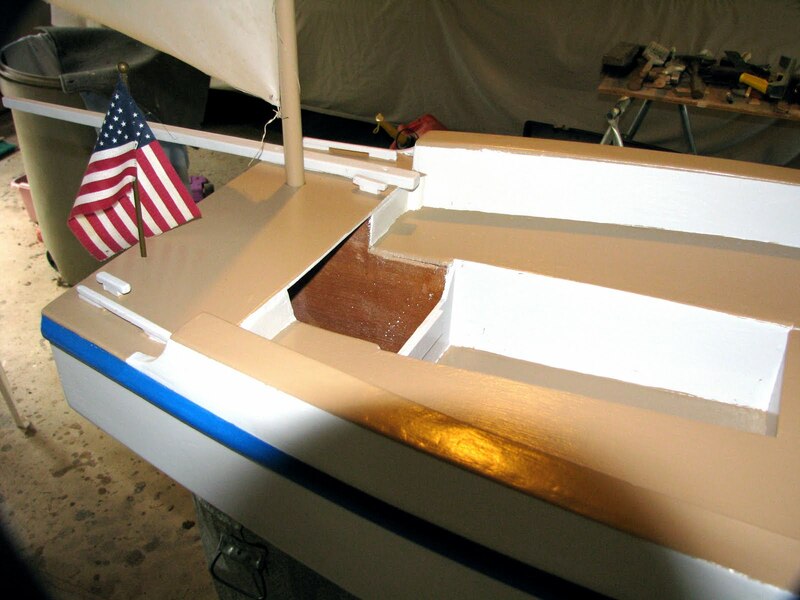 He wanted a boat that would self right after a knockdown and has been balancing the weight of the centerboard in conjunction with internal ballast to get the hull to pop up when laid over at 90 degrees. 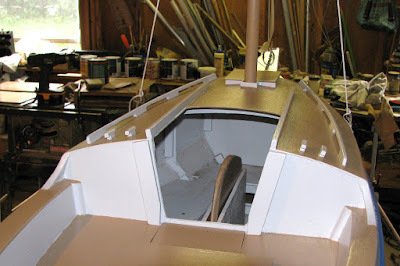 Bob is in the process of cleaning out his garage/boatshop to start building this winter. The "Beave"; At it again! Bill Beaver and I go way back; got to be close to 30 years now. Bill gravitates to tricky, hard to sail dinghies. He's mastered the International Canoe; he's proficient at the foiler Moth; he's blasted around on 505's and International 14's. Over the years, we've been involved together in many wacko sailing projects but this is one I have nothing to do with; it's all Bill. 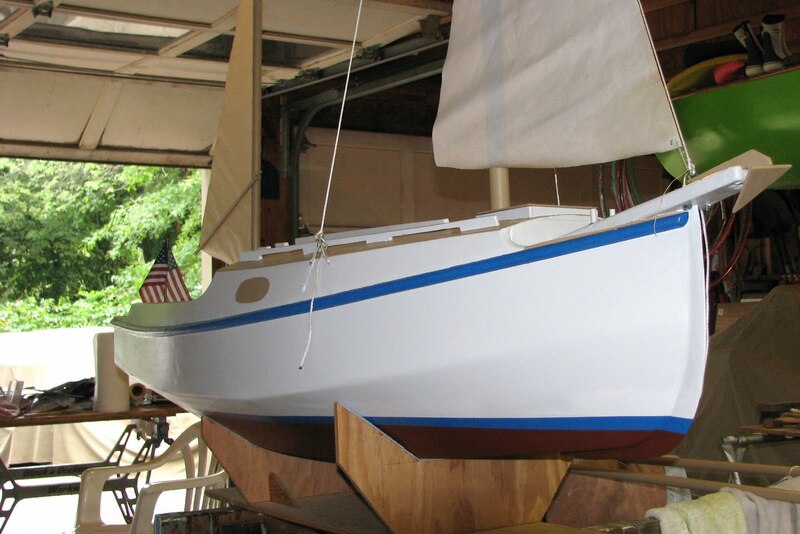 In search of a new tippy dinghy challenge, Bill worked out a trade so he is now the owner of an Australian 18 foot skiff. 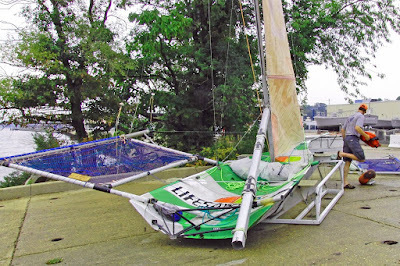 Admittedly an old style Aussie 18, circa 1980's (correction - 90's vintage - see comments), but still an intimidating, powerful beast of a sailing dinghy. Any sailor browsing YouTube can't help but come across videos of 18's with three trapezing crew and assymetric spin careening across Sydney Harbor. Bill's got a young family and the 18 has languished in his yard for most of the summer. Bill decided to enter the 18 in the Annapolis to Galesville distance race on the Friday before Labor Day weekend. 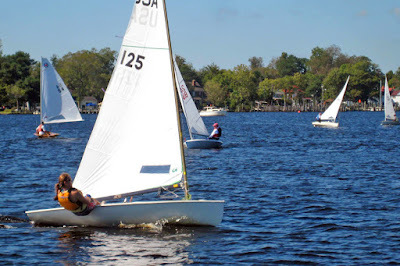 Traditionally, this down the bay race was used as a feeder for the West River SC Labor Day regatta; but today it's mostly WRSC fleets, Chesapeake 20's, Flying Scots and the high powered catamarans, that are making the trek up to Annapolis and then racing back to West River. View of the 18 foot skiff with the sails up. A video of the launch. Bill got the assymetric up at the start and was looking good bombing out of the harbor, but bit the dust shortly after gybing towards Thomas Point. 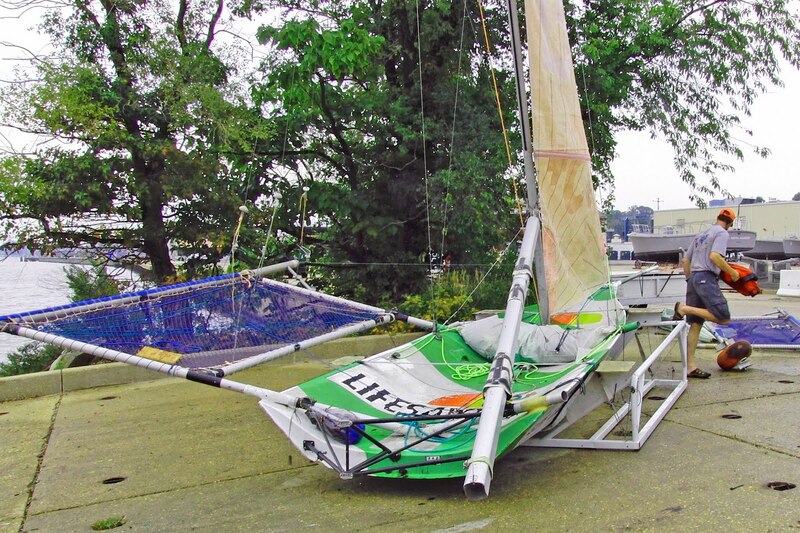 The bottom of the mainsail tore in half during the capsize so Bill returned to Annapolis. 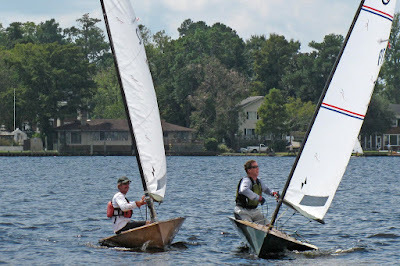 One of the events I missed this summer, to my immense disappointment; I didn't do my annual camping/boating trip to Sugar Island during the American Canoe Association Encampment. 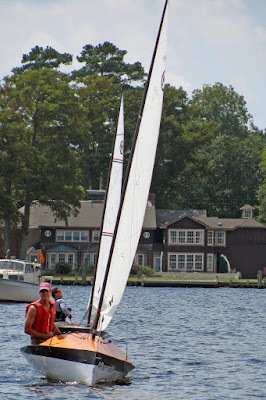 Though I've retired from International Canoe racing, Sugar Island is my yearly chance to reconnect to the IC guys still hammering around in these pure, balls to the wall, sailing machines. My post on my 2009 Sugar Island campsite is over here (for some reason that video has my co-workers cracking up). 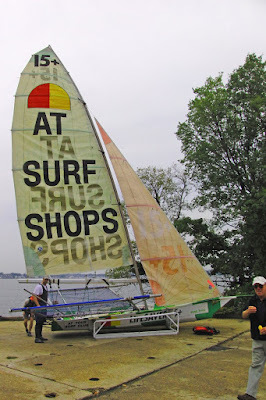 I filmed the 2009 Round Sugar Island Race (traditionally only raced once during the week but, in 2009, the IC sailors enjoyed it so much they ran it a second time). 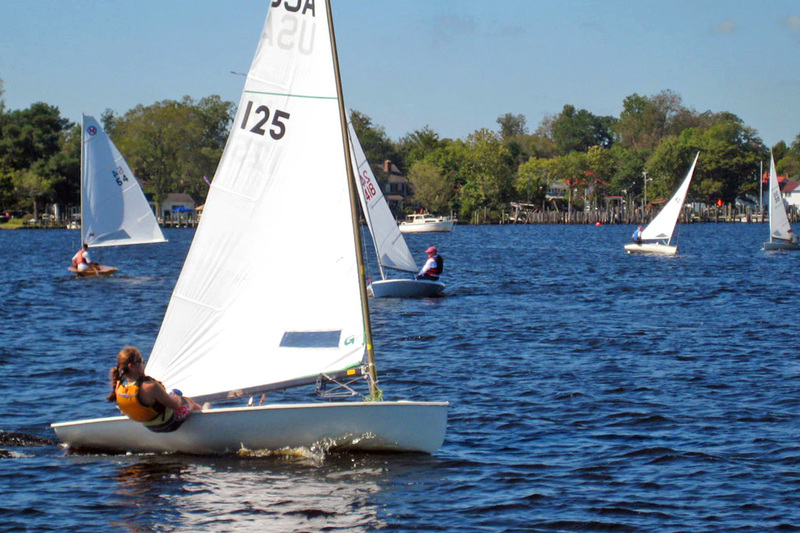 The course is twice around Sugar Island. After the first lap, you reverse direction. Start and finish is off New York Bay. I caught the action from Hurricane Point which, in the prevailing westerly's, has the most wind and a tricky cross chop bouncing off the shore. The class has changed it's rules since I raced. The new rules International Canoe is much thinner (30") and much lighter than the ones I raced. In the video, Bill Beaver is racing "Lust Puppet", an IC I owned during the 1990's. I ran into Paul Miller, another retired IC sailor this past week and he directed me to another International Canoe video, this one of the 2010 North American's in San Francisco (capsize city!). Shot by Gail Yando, significant other of Del Olsen (Del, USA 243, who I must reluctantly report is my age, and still racing these beasts hard in a breeze). Did you notice Erich Chase's partial wardrobe malfunction at about 7:38 into the video? Music Whenever; Blaze Foley; "Clay Pigeons"
Music for Fridays had become a minsnomer, so now I have renamed it to Music Whenever. Blaze Foley sounds a lot like John Prine.